Diploma in Dentistry (Dip Dent – Istanbul 1995). Masters Degree in Oral Maxillofacial Surgery (MSc OMFS 2001). As well as running Angel Dental Implant Centre, Reza also performs many specialised treatments (Sinus lift, Bone Grafting, Nerve Re-positioning and Implant placement) at more than 10 different dental surgeries around the country. Reza has many years of experience in working within Oral Maxillo Facial Departments around the UK. Reza has worked with many different Implant systems throughout his career and now can offer each patient a tailored implant system that best suits the treatment, as well as offering facial rejuvenation such as Botoxillum and Derma fillers. Reza also provides sedation to the anxious and nervous patients and making the experience a relatively more relaxed encounter. Sarah has been managing Angel Dental Implant Centre since the 2007, prior to her role as practice manager Sarah worked at Gloucestershire Royal Hospital in the Oral Maxillo Facial Department. It was here that Sarah found her interest in Dentistry and Surgery and has since managed to create a professional, caring team that we all call Angel Dental Impant Centre. Th​u–Linh is a French dentist. She graduated with honours from the Faculty of Montpellier, France. She worked in private practices and Dental care centres in France before working in UK (Oxford and London), delivering both public and private dental care. 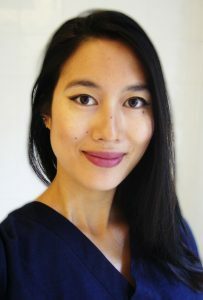 Oral surgery has always been a special clinical interest that Thu–Linh developed in Montpellier, working with oral surgeons in operating theaters. Cosmetic restorative and prosthetic dentistry are also two of her favourite fields (crowns, bridges, veneers, white fillings, internal and external whitenings) and her greatest satisfaction is bringing smile back to her patients. Membership of the Faculty of Dental Surgery (MFDS RCSEd) Royal College of Surgeons, Edinborough 2014. Mari completed her Dental Hygiene qualification in 2005 in Spain. She joined Angel Dental Implant Centre in 2008 and has been working in both NHS & Private practices across London. She loves to help her patients to achieve good oral health and prevent future problems. Prevention is her key word. Mari Paz has a loyal list of clients who have been maintaining their oral health with her for years. Due to the high demand for her services she has opened up for late Wednesdays once a month and Fridays too. Mari Paz enjoys reading, swimming, walking and spending time with her daughter. Qualified Dental Nurse – National Certificate of Proficiency as a Dental Hygienist (2007, Philippines). Graduate of Dental Medicine (1995, Philippines). Dental Technician Graduate (1992, Philippines).